There is no situation more stressful than getting ready for a big trip out of the country only to realize that you don’t have one or more of the necessary travel documents. Finding out five days before an international flight that you don’t have the right visa for your destination can derail a trip before it even has a chance to get going. Thanks to Urgent Passport, you don’t have to worry about these types of issues. 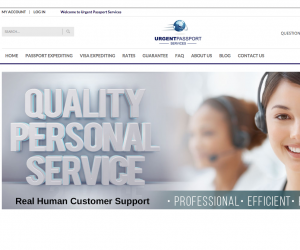 They’re a high quality expedited passport service that can get your passport, visa or other important document in your hand in as little as one to two business day. Standard processing time for these types of documents can be six weeks or more depending on the time of year. Urgent Passport solves these problems. See their services below.